Did you read the article in the Toronto Star I linked last Friday? No? Well go do it. It will take less time than me trying to explain. I'll wait. Back? Caught up on what these 'Ravellenic Games' are? Possessed of a suspicion that I was one of the rainbow revolutionaries? Of course I was. Not a ringleader, but lined up with a ball of rainbow gradient, prepared to be civilly disobedient. It didn't come to that (and none of us are labouring under the delusion that a lot of rainbow yarn will change anything) but sometimes it's important just to show up and be counted. So here's my rainbow project, at just about the halfway mark. 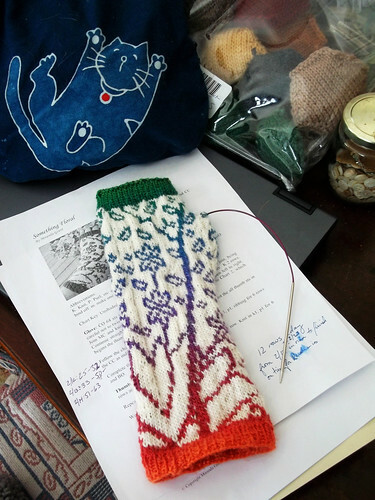 I will be making another mitten because I want one for my other hand. I have a schedule laid out; if I hit all the marks I should finish by the closing ceremonies in Sochi. I did say recently that I don't go through mittens to warrant making more than a pair every five years, but when I looked at my Ravelry queue for something suitable for rainbow-fying, this was the most logical pattern. So here's to an indefensible number of mittens.